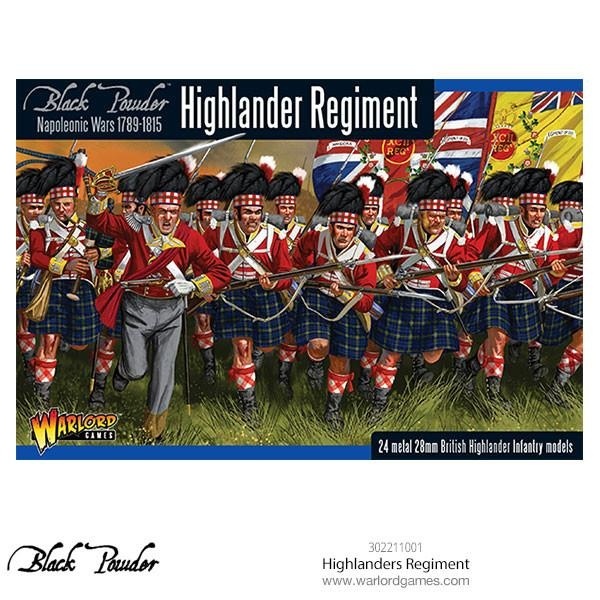 The glorious tones of the pipes can be heard as the new Highlanders Regiment march to war fully prepared to beat Napoleons forces back to France. 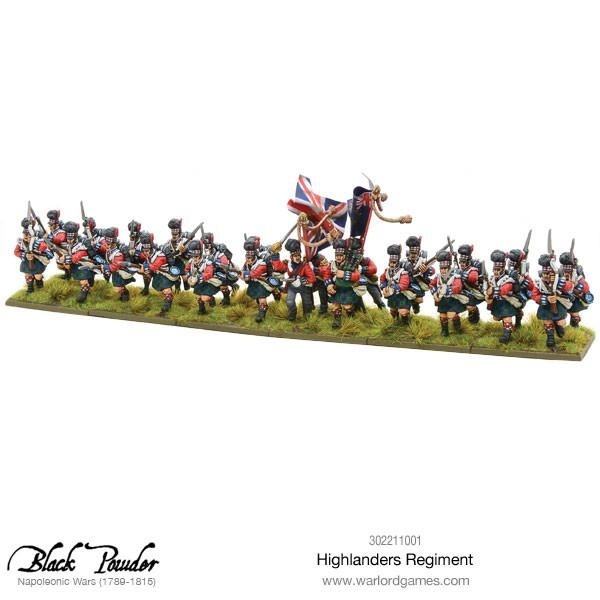 •20 metal British Highlander Line Infantry. 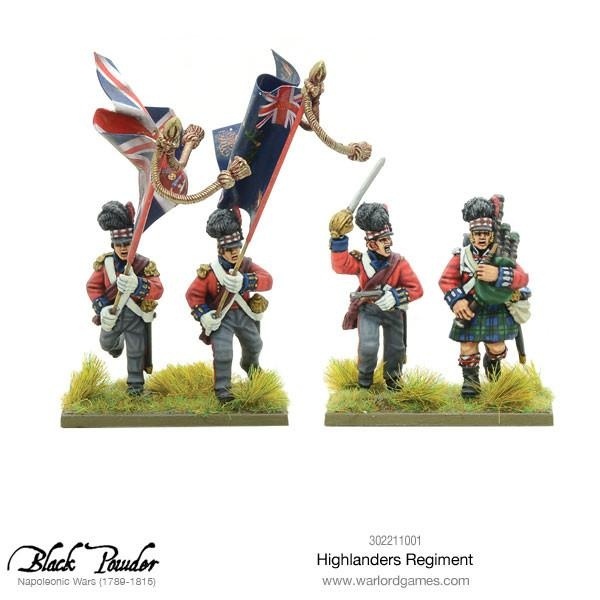 •4 metal command miniatures: officer, piper and two ensigns with wire flagpoles and finials. 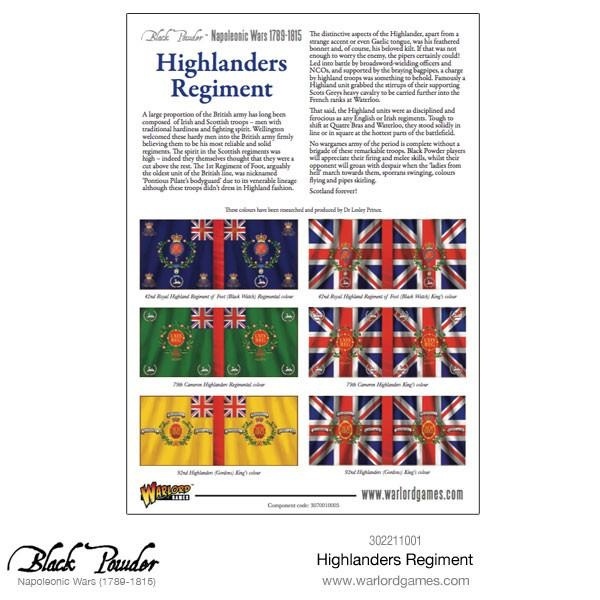 •Background guide including six full-colour flags. 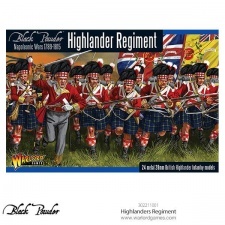 The Highlanders were good soldiers, showing great discipline and hardiness on the march. 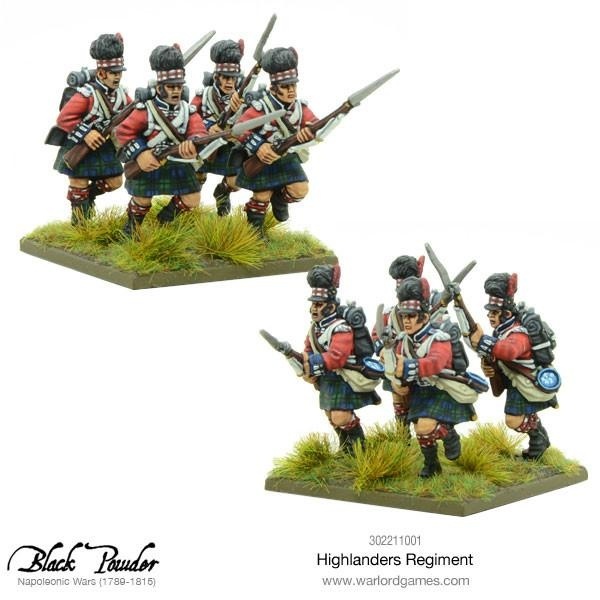 The Scots proved themselves time and again as doughty fighters – as adept with the Brown Bess musket as with their fearsome use of the bayonet in hand-to-hand fighting. 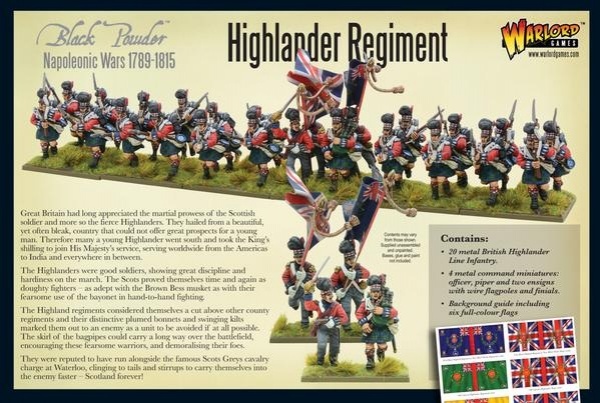 The Highland regiments considered themselves a cut above other county regiments and their distinctive plumed bonnets and swinging kilts marked them out to an enemy as a unit to be avoided if at all possible. 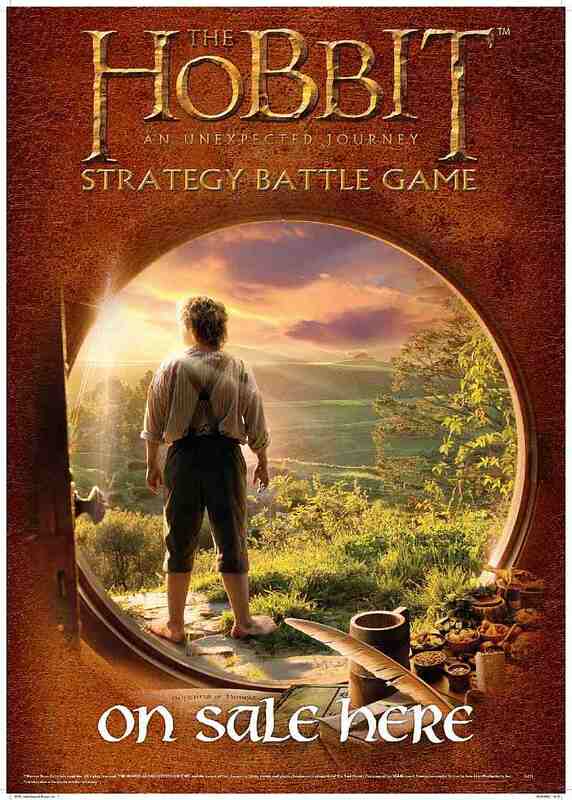 The skirl of the bagpipes could carry a long way over the battlefield, encouraging these fearsome warriors, and demoralising their foes. 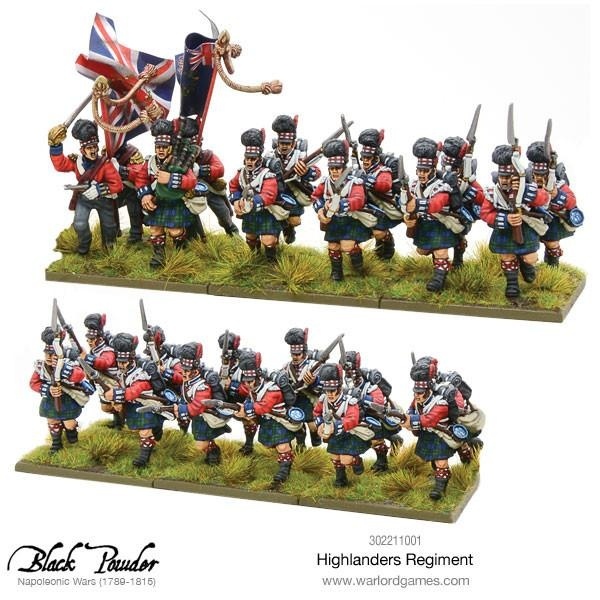 They were reputed to have run alongside the famous Scots Greys cavalry charge at Waterloo, clinging to tails and stirrups to carry themselves into the enemy faster – Scotland forever! No wargames army of the period is complete without a brigade of these remarkable troops. 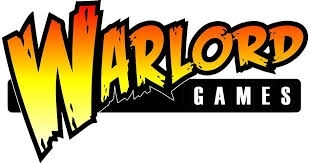 Black Powder players will appreciate their firing and melee skills, whilst their opponent will groan with despair when the ‘ladies from hell’ march towards them, sporrans swinging, colours flying and pipes skirling.